At which time a thick bank of cloud, low on the western horizon prevented further sightings. A stunning Moonrise on 6th May 2012, occurred when the moon was very close to Perigee (closest to Earth) and hence was a little larger than usual. This photo from McMahons Point grazes the Harbour Bridge approach (note the railway wiring) and includes the ridge line at Dover Heights. 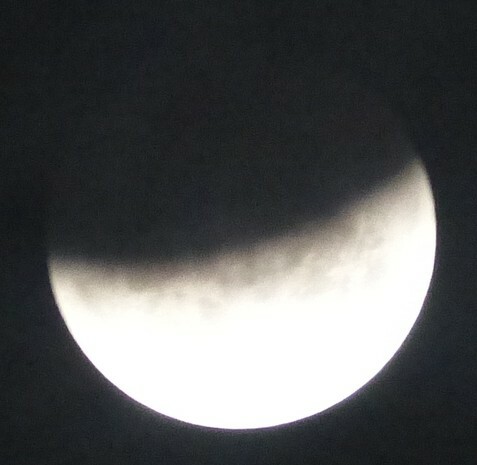 Note the distortion caused by refraction of the Moon’s shape and the left ascension also a degree of vignetting (edge darkening). Just back from the South Pacific Star Party (SPSP) run by the ASNSW 19-22 April 2012. Here are some quick photos, the others will take a while to process. Someone looking through a big dob with the milky way in the background. Foreground enhanced in photoshop to show the figure on the ladder, resized. While walking from the camp to the observing field I took this quick snap of the southern cross and pointers through a opening in the trees, Canon 5dMkii 50mm 15s f1.8 ISO h2, resized in photoshop.